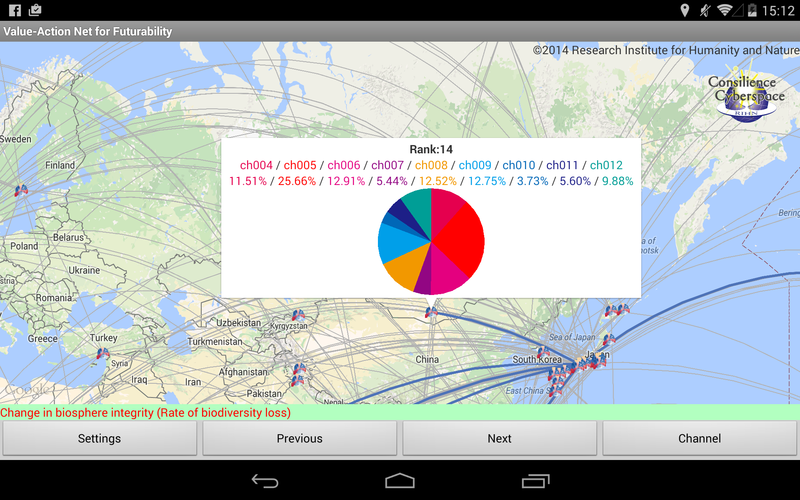 Public interests toward ‘Planetary Boundaries’ can be visualised by the app, Value-Action Net for Futurability. 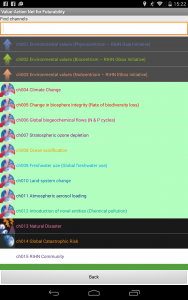 The Pie chart of each app user over the channels 4 – 12 displays the relative interests in nine Earth-system processes defined in the Planetary Boundaries framework, i.e., climate change (ch004), change in biosphere integrity or rate of biodiversity loss (ch005), …., introduction of novel entities or chemical pollution (ch012). The Planetary Boundaries framework proposed by Rockström et al. (2009) is a kind of new paradigm in the field of global environmental studies. ‘Boundary’ is an ambiguous term. Scientists engaged in meteorology, oceanography, and other geophysical disciplines conventionally use ‘planetary boundary’ to describe the boundary between solid planet and its atmosphere. Thank to the gravity, we are tapped in this planetary boundary layer, namely “In the Depths of a Gravity Well” (see the Mobile Suit Gundam UC). My preferred Japanese translation of the Planetary Boundaries is “地球の限界”, not “地球の境界”. Baum and Handoh (2014) outlined a critical difference between boundaries (human constructs) and thresholds (biogeophysical properties). In a Buddhism, boundaries and thresholds may be about our destiny and fate, respectively. Kate Raworth’s doughnut added social boundaries to Rockström et al. (2009) and the Planetary Boundaries 2.0 came out (Steffen et al., 2015). For phosphorus biogeochemical flows, the global scale threshold of Handoh and Lenton (2003) is still retained, but new regional boundaries are added. Chemical pollution is not yet quantified, while a crude estimate for PCBs was demonstrated in Handoh and Kawai (2014). I’m still working on chemical pollution Planetary Boundaries. The names of some earth-system processes were changed. My “Humanity Boundaries” is a hybrid construct between Planetary Boundaries and Social Boundaries. BTW, Prof. Johan Rockström is the winner of the 2015 (23rd) International Cosmos Prize that is awarded by the Commemorative Foundation for the International Garden and Greenery Exposition (Expo ’90 Foundation). My boss received an invitation for the award lecture, and we had a chat about the award. We think this is a kind of belated award to Johan who may well deserve a Blue Planet Prize of the Asahi Glass Foundation and more than that. I met Johan at the Planet Under Pressure 2012, London, and had a chat at the Planetary Boundaries Initiative Reception. We exchanged ideas on chemical pollution planetary boundary (see photos). The Nobel laureate, Elinor Ostrom, was also there, three months before she passed away.